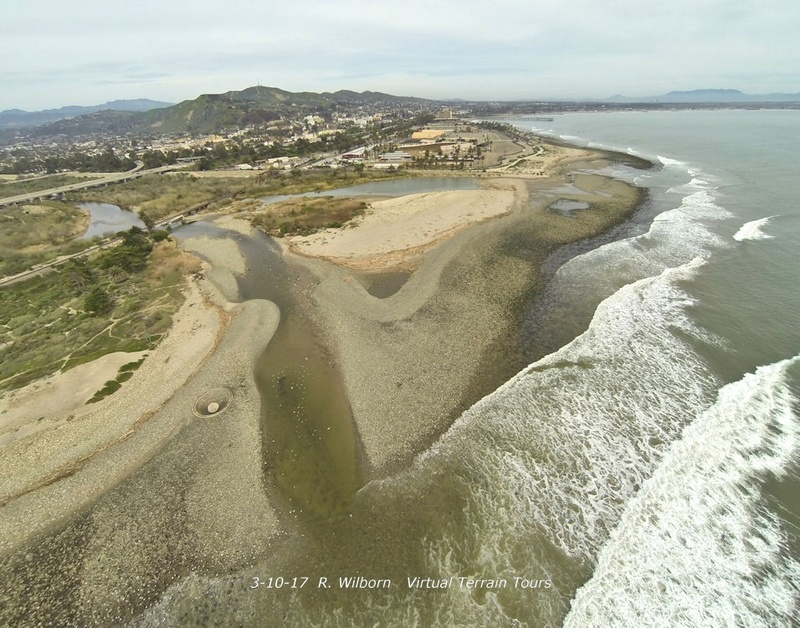 These aerial photos illustrate the beach renourishment potential of the Ventura River. Last month's storm produced peak flows of around 20,000 cubic feet per second, which is enough to scour the river's floodplain of vegetation and transport tons of sand and cobble to the beaches. 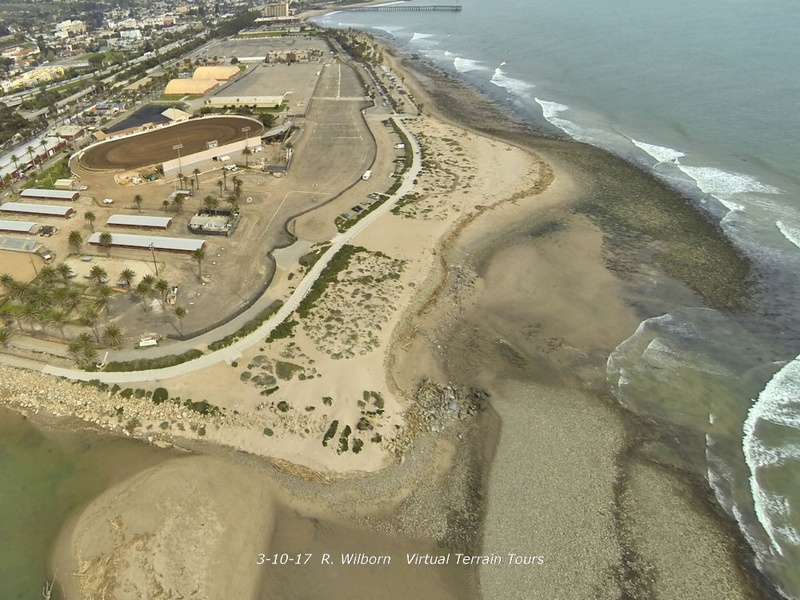 In the image above, the circle to the left of the river mouth is the historic WWII gun turret which has been situated right at the edge of the beach. The new river deposits extend almost 30 yards further out to sea. In this image, taken high above the secondary mouth of the river, the cobble and sand deposits are evident. All of these photos are taken at almost a -1 ft low tide. Every tide cycle, wave action reworks these deposits and moves the sediment down the coast (away from the viewer). This is evident in the way the sand spit is closing off this mouth of the river. This photo shows the restoration project area. The high tide line is visible, and highlighted by sticks and logs that also came from the river. Sand has moved into the area fronting the beach, and has also already moved down the beach. 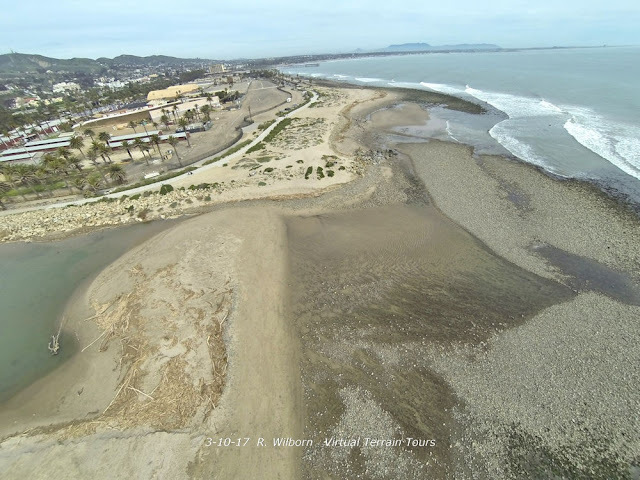 All of this new sand will move onshore over the summer, and the beaches will be wider than last year, because the extended drought was starving the beaches. Many thanks to Rick Wilborne for his aerial photography that illustrates these changes in the beach so well.